Kidney stones are small mineral deposits that can cause excruciating pain in the side and back, and sometimes nausea and vomiting. Often, a patient can pass a stone simply by drinking lots of water. But if the stone is large or causing complications, it may require more extensive treatment to remove it, such as blasting it with shock waves. Patients with severe cases of kidney stones are 26 percent less likely to receive timely treatment when they’re admitted to the hospital on the weekend, according to a study by researchers at Loyola Medicine and Loyola University Chicago Stritch School of Medicine. The study, published in the Journal of Urology, is the first to show that a risk factor called the “weekend effect” affects kidney stone treatment and outcomes. Previous studies involving other conditions have found that weekend patients experience delayed treatments, longer hospital stays, higher mortality rates and more readmissions. Loyola researchers examined records of 10,301 patients admitted to hospitals in Florida and California who received an urgent kidney stone treatment called decompression (draining urine from the kidney). Delayed treatment was defined as occurring more than 48 hours after admission. In the study, 35 percent of the kidney stone patients received delayed decompression treatment. Their mortality rate, 0.47 percent, was nearly three times higher than the mortality rate, 0.16 percent, of patients who received early treatment. “The implication of these findings is that hospitals and clinicians should strive to deliver the same prompt, high-quality care over the weekend as during the work week,” Loyola researchers wrote. An earlier Loyola study identified five resources that can help hospitals overcome the weekend effect: higher nurse-to bed ratio; full adoption of electronic medical records; inpatient physical rehabilitation; a home-health program and a pain management program. 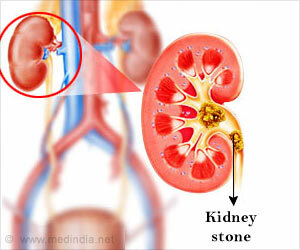 In addition to weekend patients, other kidney stone patients who experienced delayed treatment were African Americans, Hispanics and patients who were uninsured or had public insurance such as Medicare and Medicaid, according to the study by senior author Gopal Gupta, MD, first author Robert Blackwell, MD and colleagues. The prevalence of kidney stones in the United States is estimated to have doubled during the past 15 years, and roughly one in 10 Americans will experience a kidney stone attack during their lifetimes. In some cases, a kidney stone can cause a urinary tract infection, acute renal insufficiency (poor kidney function) and/or sepsis (a potentially life-threatening complication of infection). The standard treatment in such cases is decompression, in which a tube or other device is used to drain urine from the kidney. The weekend effect studies were conducted by Loyola’s predictive analytics program, which mines large data sets to predict health outcomes. In addition to the weekend effect studies, researchers are studying, for example, how many rectal cancer operations a hospital needs to perform for the best results, and whether having a trauma department confers a beneficial “halo effect” on patient outcomes across the board. Large new databases, electronic medical records and more powerful computers are enabling researchers to conduct such studies. “We’re now able to ask and answer a broad range of questions that could significantly help improve patient care and reduce costs,” said Paul Kuo, MD, MBA, FACS, a co-author of the kidney stone study who heads Loyola’s analytics group called One to Map Analytics. Dr. Kuo is the John P. Igini professor and chair of the department of surgery of Loyola University Chicago Stritch School of Medicine.